Diese App dient zum Einrichten der SunApp.This app is used to setthe SunApp. 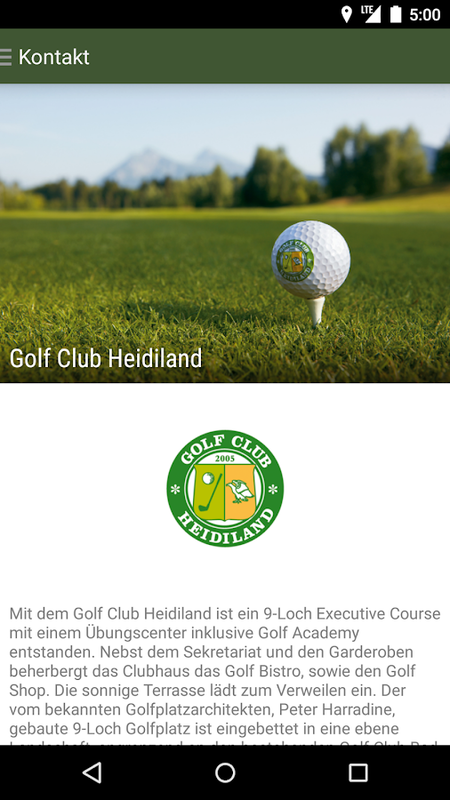 Informationen rund um das Golfspiel am GC Bodensee Weissensberg.Mit Hilfe dieser App erhalten Sie einen nützlichen Begleiter beimSpielen am Platz, mit Birdiebook, GPS Anzeige mit Abstand zuHindernissen und zum Grün, die neuesten Informationen überTurniere, Aktionen des Proshops, Golfkurse und auchWetterwarnungen.Information about the game of golf at the GCBodensee Weissensberg. With the help of this app, you get a usefulcompanion playing on the court, with Birdiebook, GPS display withdistance to obstacles and on the Green, the latest information ontournaments, actions of the pro shops, golf courses and evenweather warnings. Im Herzen des Wendlandes, dicht am Randeeinesder größten und schönsten zusammenhängendenWaldgebieteDeutschlands, liegt die 1968 gegründete Golfanlage desGolf-Clubsan der Göhrde e. V.Die Spielbahnen ziehen sich durch ein leicht hügeliges Gelände.Diemeisten Fairways sind von dichtem Nadelwald umgeben,derstellenweise durch heidetypisches Gewächs aufgelockertwird.Spielstrategisch raffiniert platzierte Wasserhindernisse–unteranderem Inselgrün- und Bunker runden den Platz zu einer fürGolferjeder Spielstärke zu bewältigenden Herausforderung ab.Golfinteressierten bietet der Golf-Club an der GöhrdedieMöglichkeit, an einem der Schnupperkurse teilzunehmen.Geleitetwird der Unterricht von einem qualifizierten PGA-Pro, dernatürlichfür Einzel- als auch für Gruppenunterricht zurVerfügungsteht.Für alles, was das Golferherz begehrt, lädt der gutsortiertePro-Shop ein. Die modern aber behaglich eingerichtetenClubräumemit der großen Sonnenterrasse bieten eine einladendeKulisse fürdie gepflegte Gastronomie.Besuchen Sie uns! Gäste sind gerne gesehen undherzlichwillkommen.In the heart ofWendland,close to the edge of one of the largest and mostcontiguous forest,lies the golf course founded in 1968, the golfclubs on the Goehrdee. V.The fairways run through a slightly hilly terrain. Most fairwaysaresurrounded by dense coniferous forest, which is inplacesinterspersed with heather typical greenhouse. GameStrategicallyplaced water hazards refined -having other Inselgrün-and bunkersround out the space to a for golfers of all levels to beovercomechallenge.Interested in golf offers golf club at the Goehrde theopportunityto attend one of the introductory courses. This is alesson from aqualified PGA pro, of course, available for private aswell asgroup lessons.For everything a golfer's heart, invites the well-stocked proshop.The modern but cozy furnished club rooms with large sunterraceprovide an inviting backdrop for fine dining.Visit us! Guests are welcome and welcome. Free golf GPS rangefinder, scorecard and shot tracker. Easy to use.Tap to measure distance to any point on the course. Satellite viewswith aerial flyover of every hole on any of over 40,000+ worldwidecourse. Conforms to tournament rules. Optimized to save batterylife. No registration required to start playing. Optional: trackyour game automatically with Golf Pad TAGS! Know the distance ofevery shot. Get actionable insights like shot dispersion, strokesgained and course strategy. Available at golfpadgps.com. Just needa fast, free golf gps rangefinder and scoring app? Download GolfPad GPS, it works with or without TAGS. Many features that costmoney in competitor golf gps apps are included free in Golf PadGPS. Like instant distance to front/middle/back of the green,detailed scoring for up to 4 golfers, aerial maps with flyovers,tee-to-green shot & club tracking, and more. This is not atrial or a demo. Play as many courses as often as you like,anywhere in the world. It's FREE. Get extended statistics,smartwatch sync and handicap scoring with Golf Pad Premium. Workswith Android Wear and Samsung Gear watches. Free featurehighlights: * Free golf GPS rangefinder. Instant distance tomiddle/front/back of the green, or any point on course * FreePGA-quality scorecard for 1-4 golfers. Track strokes, putts,penalties, sand and fairways for every player * One-tap shottracker . Easily record positions and clubs, measure length of yourshots. Use it for drives or for every shot from tee to green.Review shots on the map and share with friends * Free aerial map.Tap to measure golf gps distance to bunkers, water or any otherpoint on golf course * See rangefinder distances right on yourscreen, without unlocking the phone * Keep full playing history.Review and edit scores or add notes for past golf rounds at anytime * Conforms to USGA tournament play rules with Regulation Mode* Track your progress with detailed statistics, including scoring,putts, accuracy, penalties, fairways, sand, GIR and distance walked* Play with your friends with group rounds and online leaderboards* Improve your game with the revolutionary Strokes Gainedshot-by-shot analysis. * Share rounds on Twitter, Facebook oremail. Your friends will see the scorecard, notes and shots map asyou play or after the round * GPS rangefinder supports meters oryards Always Evolving We listen to our users and consistently addnew features to make Golf Pad GPS even easier and more useful. Ifyou have a feature request, a question or need help, seesupport.golfpadgps.com. You can even contact our team from the appor using our live chat feature on our website. We’re happy to help.Join over 2,000,000 golfers who use Golf Pad GPS rangefinder &scorecard over any other golf gps navigator apps. Over 6 millionrounds played and counting. Learn more at www.golfpadgps.com. Checkout our reviews. Golfers LOVE this free golf GPS and scoring app!★★★★★ Simply the best I've tried so many other apps and GPS gadgetsfor golf alongside Golf Pad and this remains top pick for me,friendly on battery and accurate and all recent update functionsmake this app an utter joy to use. 10 stars from me. Simple, Accurate Golf GPS Range Finder. Calculate range/distance toany point on the golf course. No need to download course maps,works with Google maps and GPS technology to give you quick,accurate range finding. Easiest and most effective Golf GPS forAndroid! You Get: * A GPS Rangefinder with accuracy rivaling anyother app or $300 device. * A Birds-Eye view of the hole you areplaying on ANY COURSE IN THE WORLD. * Zoom in and touch anywhere toget distance from you to that point. * Easily plan multiple shotsby tapping more than once. * Saves battery by turning off GPS inbetween holes. * Press the bottom button to start measuring how faryou nailed that ball down the fairway! NO clutter or unnecessaryfeatures. This app gives you all the information you need to take afew strokes off your game. Uses advanced GPS distance algorithmsfor the most accurate range finding. Tried and tested on the golfcourse, this app will help you bring your game to the next levelwithout breaking the bank on an expensive rangefinder. All of theaccuracy without the cost. Google Maps will let you easily see allcourse markers and obstacles. Measure the distance from yourself toany point with only one tap. Tap again and measure the distancefrom that point. Easily plan out all of your shots and knock acouple strokes off your Golf game. Features * Measure multipledistances to plan out your shots * Zoom back to your location withone tap * Easily clear all measurements * Turns off GPS when inbackground to save battery * Switch between Yards, Feet, Meters,Miles, and Kilometers * Easily find how far you hit the Golf Ballwith the bottom button. This rangefinder uses GPS technology toquickly and accurately find the distances that you need to keepyour golf game on the fairway. New for 2019, the GolfLogix app now reads your putts and shows youexactly where to aim them, displays 3D greens on approach shots soyou know how your ball will roll when landing on the green, andgives you precise GPS distances on every tee! GolfLogix is so easy,fast and fun to use on the course that it seamlessly blends withall of your normal golfing routines. Experience this groundbreakingtechnology to help you shoot lower scores. There is even an optionto turn-off the Putt Line when playing in USGA sanctioned events.Golfers around the world have trusted GolfLogix for exact GPSdistances, full-color 3D course maps, 4-player scoring, pro-levelstats and handicap tracking and now they can all see exactly whereto aim their putts. Install it now and try the next two rounds forFREE. GolfLogix has mapped over 35,000 courses worldwide for GPSdistances with highly-accurate 3D green maps that show you where toplace your approach shots and how your putts will break on over12,000 courses. It’s like having a professional caddy with you atall times to help you manage your game and shave strokes off yourscore!